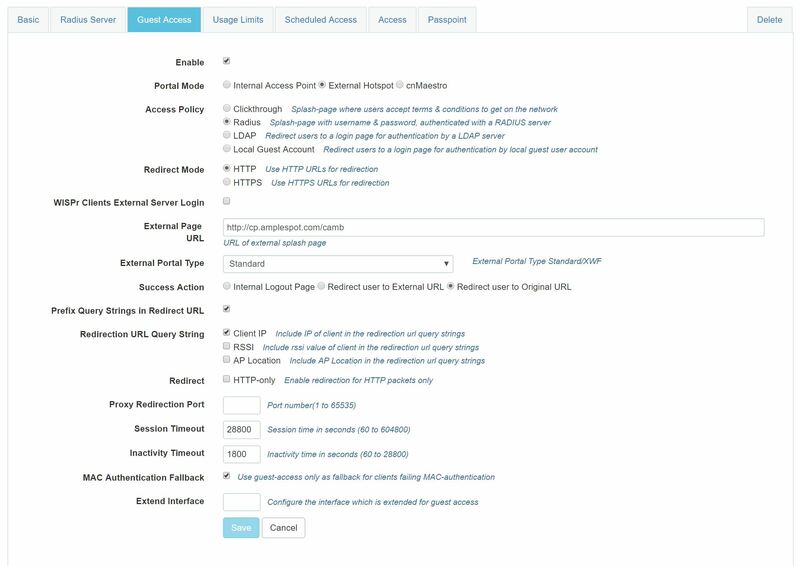 This guide shows how to configure a Cambium Networks access points in order to use it as External Splash Page provider with Amplespot. This integration has been tested with the following devices but shall work with any cnPilot device. This guide presumes that you already have knowledge and experience working with Cambium equipment. Note the MAC address(es) of your access points together with the names you might have assigned. Head to your Amplespot Admin Dashboard and, if you haven't done so already, create Zone(s) where you want to add your access points. Or you can use the default (automatically created) Zone and change your settings later. Select the access point Make & Setup Type (Cambium) and Model, enter MAC Address, Name, select the Country where access point is located and the Captive Portal Zone where you would like to add this Access Point. You will be able to add other Zones later. Select the captive portal Zone where you want to place this access point. You will be able to add the access point to other Zones later. Repeat this step for all your access points. Contact Amplespot support if you need help importing a large number of access points. If you are using cnMaestro, select Configuration in the main menu and then click on WLANs and AP Groups. If you are using cnPilot, select Configure and then WLAN in the main menu and then click Add WLAN button. Set VLAN ID to what your network architecture requires or to "1" if you are not using the VLANs. Create VLAN with following settings and make sure that the name of SSID on Cambium exactly matches SSID of the Network as it is set in Amplepsot Admin Portal. To get your RADIUS configuration settings please follow this documentation article. You will now enable guest WiFi users to access certain external URLs before they are authenticated. This is necessary so users can reach Amplespot-hosted sign-in pages as well as pages of third-party social login provides (such as Facebook or Google) you may want to use. Please open the Walled Gardens page to get the URLs you will need to Whitelist. You must add all URLs listed in Amplespot Required on that page section and can add any other URLs of your choice (such as social sign-in URLs or your company website URL). Click Save and Sync your changes to the access points if you are using cnMaestro. You have now completed setting up your Cambium guest WiFi network to work with Amplespot. Connect to it to test your settings!